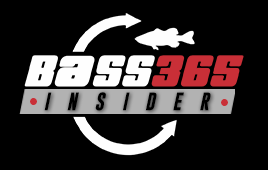 Bass 365 Insider is our version of using the “Power of the Crowd” with our industry contacts to get discounts on their products and services. Every month we’ll launch at least 10 discounts for 10 different companies. Members will also be alerted of large discount/short time framed FLASH DEALS throughout the month. .
Click registration above or use this link. From there you will use your email and create a password for your account. Payments will be set up through the very secure Paypal service. Payments can be made with a Paypal account or a credit card through the Paypal service. Payments are recurring every 30 days, but you can cancel your membership at any time. Beware, if you cancel your $2.99 membership you lose that rate if you rejoin at a later date. Here is a sample of what you will get each month as a Bass 365 Insider! 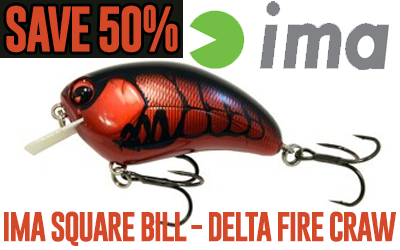 50% Off – That is not a typo, get the Ima Square Bill crankbait in fish catching Delta Fire Craw for 50% off. The Square Bill, named for Ima professional Bill Lowen, is a go to bait for tournament and weekend anglers alike. Delta Fire Craw is a very versatile color that produces in clear and dirty water. Take advantage of this stellar deal today as it goes away on February 1st. 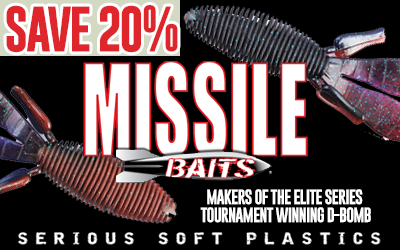 20% Off – Missile Baits is the maker of several Elite Series Tournament winning baits. Their innovative soft plastic baits are sure to put more fish in your boat. Some of their most popular baits include the D-Bomb, Baby D-Bomb, 3.5 & 4.25 Shockwave swimbait, but for something new give the Drop Craw a try! Save 20% now. 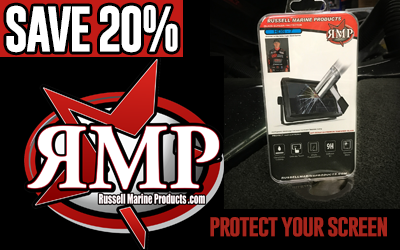 20% Off – Russell Marine Products makes some truly innovative products for your boat. This month they are offering 20% off to Bass 365 Insiders for their Electronics screen protector. Protect your investment now, but stay tuned for more great deals on Russell Marine Products… only for Bass 365 insiders! 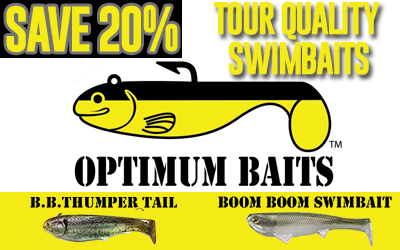 20% Off – Optimum Baits makers of fine swimbaits and other lures is offering 20% off all Optimum Baits Products. The Boom Boom Swimbait is the newest generation of an all time favorite swimbait and is being used by many Elite Series and FLW Tour anglers. The B.B. Thumper Tail, designed by noted big fish hunter Butch Brown, is a staple in any Trophy Fisherman’s tackle box! 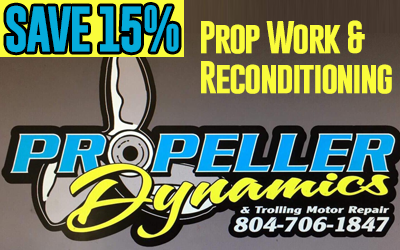 15% Off – If you are a serious bass angler it’s not IF you damage your prop, it’s when you damage your prop. Take advantage of the winder months to get your prop reconditioned and ready for the new season. Propeller Dynamics is one of the best in the business and is relied on by many Elite Series and FLW Tour pros. Get the most out of your prop send it to Prop Dynamics now! 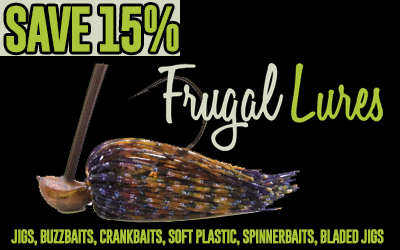 15% Off – Frugal Lures makes high quality hand made fishing lures that are affordable. Nick, the founder of Fishing Frugal Lures, has an attention to detail that will make sure you love his lures and your wallet will be happy too. Save an extra 15% off your order as a member of Bass 365 Insider! 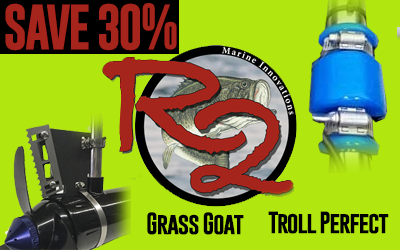 30% Off – R2 Marine Innovations has revolutionized the trolling motor product industry. Get 30% off on any Grass Goat or Troll Perfect accessory. The Grass Goat eliminates virtually all trolling motor trouble from vegetation. The Troll Perfect eliminates noise and makes any steering torque on all cable steer trolling motors. 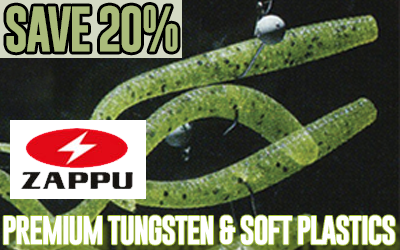 20% Off – Zappu, makers of premium Japanese Tungsten and soft plastics is offering 20% off to Bass 365 Insiders. Check out ingeniuity of their AbareDama to add weight and get your crankbaits or swimbaits deeper or their Shooting Star to add more to any soft plastic bait. It’s obvious Zappu is a company of anglers looking for new and creative ways to get more bites! 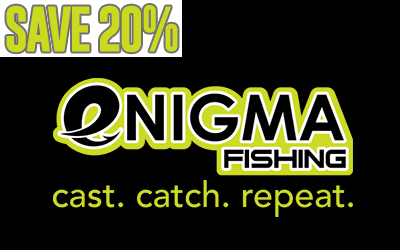 20% Off – Enigma Fishing offers quality fishing rods including Aaron Martens’ Aaron’s Edge line, the Phenom line and HPT line of rods. The 20% off discount is site wide which includes their selection of 13 Fishing, Ardent, Daiwa, Lews and Shimano reels. 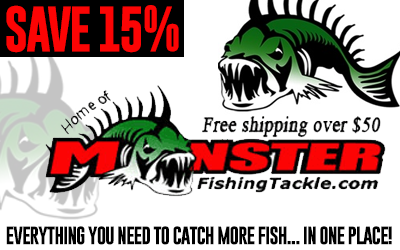 15% Off – Monster Fishing Tackle, known locally in California as Outdoor Pro Shops, is the West Coast’s fishing headquarters. Known for it’s 30,000 square foot super star showcasing the best in fishing for all species. Their top notch customer service keep customers coming back time after time. 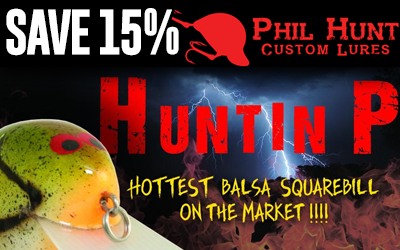 15% Off – PH Custom Lures are one of the finest hand made custom painted crankbaits on the market. Since 2006 PH Custom Lures has been grabbing the attention of anglers around the country. Be sure and check out their PH Huntin P Squarebill and for out of this world top water action PH – Wesley’s Ploppin P is a must have! As a member of Bass 365 Insider you can get all PH Series baits for 15% off for a limited time!